11.23.060 General building design guidelines. 11.23.070 Ground-floor retail and pedestrian-oriented uses. 11.23.080 Guidelines for building frontage types. 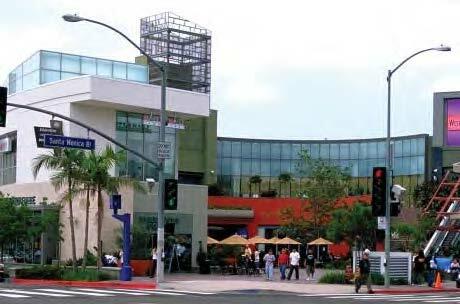 The development and design standards and guidelines are organized as a series of sections that address important design considerations for achieving pedestrian- and human-scaled development, and reinforcing a sense of place and vibrancy throughout South Gate’s mixed-use areas. The development and design standards and guidelines outlined in this chapter focus on overall site planning and development, as well as the overall character and quality of buildings, retail and pedestrian-oriented development, and the design of building frontages. Consideration of these standards shall be equally important to the permitted land uses and development standards identified for each zone. A. All development, redevelopment, expansions, and modifications of buildings and uses within the urban mixed-use zones. B. All mixed-use development projects located in other zones throughout the city. 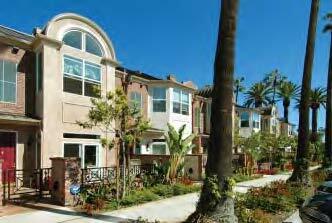 C. All residential development projects of twenty-one units or more located in any zone throughout the city. A. All standards, dimensions, and requirements identified with mandatory language, including the words “shall,” “will,” “is to,” and “are to,” are always mandatory. Additional guidelines provided throughout this chapter, incorporating language such as “should,” indicate that the standard is not mandatory, but is strongly recommended. B. Per Section 11.10.080, all standards, dimensions, and requirements of this title are minimum requirements unless otherwise noted. C. To provide for flexibility in development and to promote innovative design, administrative modifications to the standards are permitted, subject to Section 11.30.030, Administrative modifications. Guidelines for block size, massing, building design, and landscape design are provided within this title to provide direction on how to create pedestrian-oriented development and a high-quality public realm. For larger sites, subdivision should first be used to create a connected network of smaller, pedestrian-scaled blocks and define open space or other special uses. The following steps are illustrated to help highlight key standards and design strategies. 1. Step 1: Identify Parcel Location and Applicable Zone(s). Review Section 11.20.040, Citywide zone mapping, to identify the location of your parcel(s), applicable zone(s), and allowable uses. Review the applicable portions of Chapter 11.22 to identify standards for intensity, building form, frontage types, and other requirements. 2. Step 2: Define Block Size and Individual Lots. Large sites with vacant blocks or parcels should be subdivided further to create additional blocks. Subdivision should create a connected, pedestrian-scaled block and street pattern. 3. Step 3: Identify Alleys. 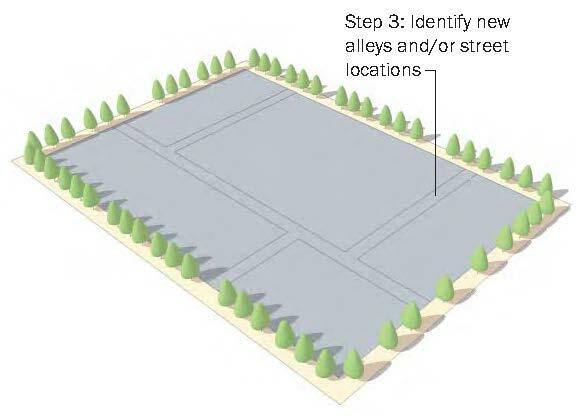 Primary vehicular access to blocks and their individual lots is preferred along alleys and side streets, except as otherwise allowed within specific zones. The intent of limiting access to the rear or sides of lots is to maintain the continuity of the streetscape and pedestrian realm. Additionally, design solutions should minimize the impact of residential and commercial driveways by using shared driveways, alley access, or other design approaches to minimize the number of driveways and curb cuts. 4. 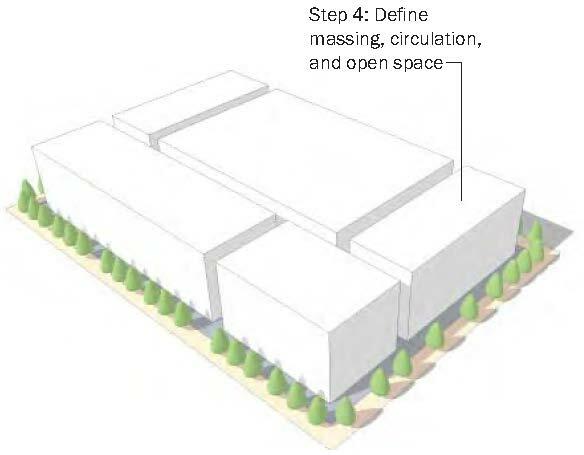 Step 4: Define Massing, Circulation, Open Space, and Special Uses. All development projects, including full-block and half-block projects, should make an attempt to break down the scale of the development by defining smaller buildings, open space, landscaped setbacks, pedestrian paths, and paseos. A. Special uses such as retail building frontages, pedestrian-oriented uses, and public uses should be appropriately considered in the building design. Refer to Section 11.23.070 for specific guidelines related to the design of ground-floor retail and pedestrian-oriented uses. B. All buildings that include residential units are required to comply with the standards of Section 11.25.070, Residential operating standards. 5. Step 5: Consider Adjacent Uses and Architectural Compatibility. All development projects, including full-block and half-block projects, should consider their adjacency to other existing uses. A. 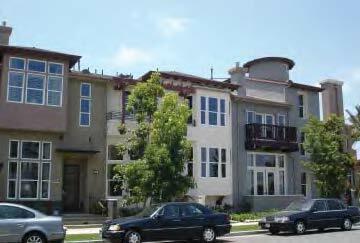 The design of mixed-use projects, where sited adjacent to single-family residential uses, should incorporate appropriate transitions wherever possible. Acceptable transitions include the incorporation of setbacks, open spaces, or upper-story stepbacks. B. Architectural unity and harmony should be achieved both within the project, and between the project and the surrounding community, so that the project does not constitute a disruption to the established fabric of the community. This should be considered in the design approach to all buildings, structures, walls, and fences. C. All remodeling, modification, expansion, and redevelopment of residential buildings should be architecturally compatible with the main building; any required permit for such activities shall be conditioned to ensure architectural compatibility. D. Sites and structures should be designed to minimize or buffer any undesirable characteristics of the site such as street noise and nearby commercial or industrial uses. 6. Step 6: Provide Pedestrian-Scaled Elements. Building massing should be reduced through changes in building height and roof form, and the introduction of pedestrian-scaled elements. A. Emphasize corners and special places through changes in height and building form. B. 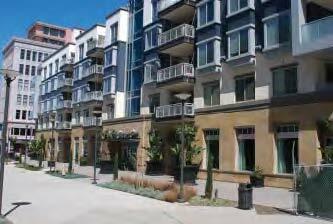 Incorporate the design of building frontages, per Section 11.23.080, as required in specific areas. 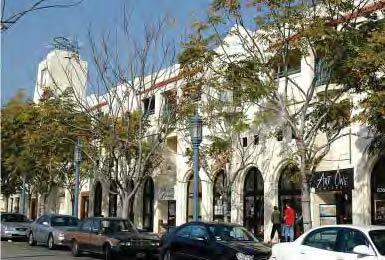 Over time, the design of building frontages will serve as character-defining elements for districts and special places throughout South Gate. C. Reduce massing by incorporating pedestrian-scaled elements such as trellises, patios, and balconies. D. Limit blank walls and use changes in massing and building planes to add depth and scale to building frontages. 7. Step 7: Incorporate Landscape Elements. Incorporate landscape elements and gardens to define building entries, pathways, and semiprivate open spaces, and to add special character to building setbacks. Integrate roof-top components such as landscapes gardens, trellises, and sustainability features. For specific landscape standards, see Section 11.20.070(B)(7). 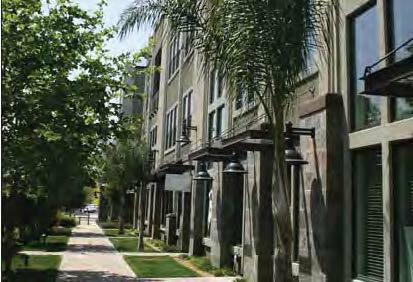 South Gate has a variety of parks and open spaces that provide recreation, relaxation, and entertainment opportunities. Additional well-designed accessible open spaces sprinkled throughout the city will create a strong sense of place throughout South Gate, and ensure that open space is within walking distance of new development. A. New Development Requirement. 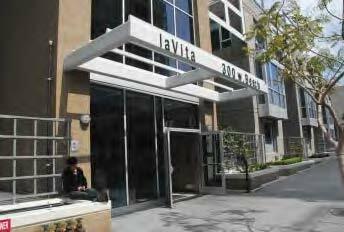 All new development in urban mixed-use zones is required to provide open space. Types of open space allowed include common outdoor open space and private open space, in accordance with Table 11.23-1. 1. Each project shall provide common outdoor space at grade, podium, or roof level. 2. Common outdoor open spaces directly accessible and visible from the public right-of-way are encouraged. 3. Minimum area for common outdoor open space is 1,000 sq. ft. for projects of 21 or more new residential units and 500 sq. ft. for all other projects. Minimum dimensions of at least one portion of the open space shall measure 40 feet by 12 feet or greater. 4. All common outdoor open space areas shall be well-designed. Common outdoor open space may include rooftop decks, court game areas, tot lots, swimming pools, landscaped areas, community gardens, and courtyards. At least 10% of the open space area shall be planting. 10,001 – 30,000 sq. ft.
Each project shall provide at least one community room of at least 500 sq. ft.
1. The area shall be located adjacent to, and accessible from, the common outdoor open space. 2. Area may contain active or passive recreational facilities, meeting space, exercise rooms, computer terminals or other activity space but must be accessible through a common corridor. At least 50% of all residential dwelling units shall provide private open space on a balcony, patio, or roof terrace. 1. Minimum area of private open space is 36 sq. ft. with a minimum width of 6 feet. 2. Shall be accessed at the same level as a kitchen, dining room, family room, master bedroom, or living room within the unit. 3. Modifications or exceptions to the above requirements may be made by the director where finding can be made that the required private open space meets the overall intent and purpose of this section. B. Forms of Open Space. Open space may assume various forms, but all open space should be expansive or uninterrupted, except for paseos or other through-block connections. Required setback areas cannot be used to satisfy open space requirements. C. Configurations. The director may consider alternate configurations and amounts of open space on a project-specific basis if such changes would be consistent with the intent and goals of this title. The following standards underscore basic design principles that are intended to produce high-quality buildings, memorable places, and a vibrant urban realm. They are not intended to be indicative of any style, but to encourage innovation and good urban form. 1. Every building should incorporate an allowed frontage type along the lot’s primary frontages. 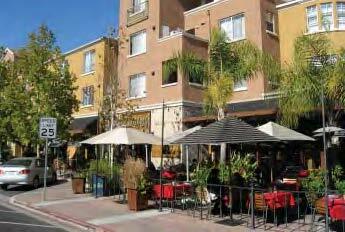 Primary frontages include building façades adjacent to a public right-of-way, including a public open space such as a plaza, park, or paseo, as well as private open space such as a forecourt or courtyard. Allowable frontage types are identified in Chapter 11.22 by zone, and detailed in Section 11.23.080. 2. 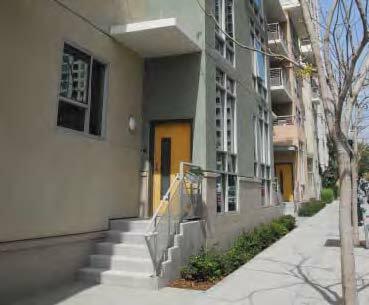 Residential units should face the street with windows, front entry doors, porches, balconies, patios, and stoops. Rooms such as living rooms and dining rooms shall be oriented fronting toward the street and/or any adjacent private space. Service rooms and areas shall be oriented to the rear of the lot. 3. Where courtyards, paseos, or greenways exist, residential units should face these spaces with windows, front doors, porches, and patios, and according to the standards of this section. B. Treatment of Building Façades. 1. Variation and expression of building details, form, line, colors, and materials should be used to create visual interest. 2. Variation in wall plane and roof line is strongly encouraged to reduce the scale and bulk of buildings, and to add visual interest. 3. Individual units should be expressed wherever possible. This may be accomplished in a variety of ways, such as through a change in wall plane, change in color, or change in roof form. 4. Street-facing building façades should incorporate pedestrian-scaled elements such as balconies, awnings, doors, and windows to enliven the street edge, and increase safety by adding eyes on the street. 5. Blank walls, without windows, doors, or other articulation, are strongly discouraged. The maximum length of any blank wall should be limited to twenty feet. 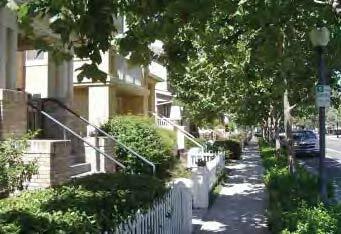 Development, including residential uses, should address courtyards, paseos, and greenways. Individual units should be expressed wherever possible. This may be accomplished in a variety of ways, such as through a change in wall plane, change in color, or change in roof form. It is the intent that each zone support a network of interconnected streets and open spaces that accommodates vehicles while maintaining a balanced physical environment conducive to pedestrian activity and a walkable street network. Specific standards for ground-floor retail and pedestrian-oriented uses are identified by zone within Chapter 11.22. The purpose of regulating these uses is to encourage active land uses in certain areas such as restaurants, retail stores, civic uses, entertainment, and dining to provide a vibrant, pedestrian-oriented experience throughout much of the day. 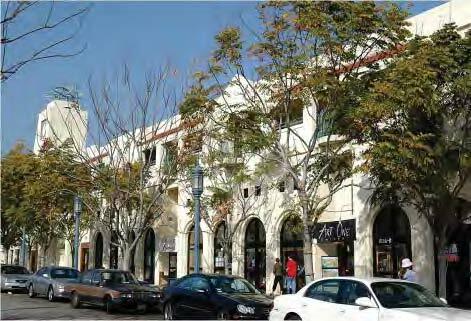 These uses are a defining component of South Gate’s corridors and districts, and serve as key elements of mixed-use and multistory development. Pedestrian-oriented uses include active uses that are accessible to the general public, generate walk-in pedestrian clientele, and contribute to a high level of pedestrian activity in the public realm. 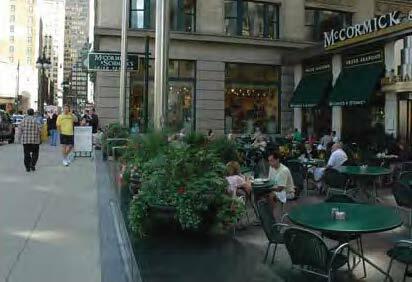 Typical pedestrian-oriented uses include ground-floor retail such as retail shops and grocery stores, as well as restaurants, outdoor dining areas, bars, theaters, performing arts, recreation and entertainment, personal and convenience services, building lobbies and building common areas, civic uses, libraries, museums, galleries, and public plazas. Along main street areas, such as within the main street zone and the civic center zone, approximately eighty percent of the ground-floor street fronts should contain active uses. The guidelines apply only to the ground floor. The director shall consider uses other than retail or pedestrian-oriented uses in cases of uncertainty or special configurations. A. General Requirements for Ground-Floor Retail and Pedestrian-Oriented Uses. 1. Ground-floor floor-to-ceiling height should be at least ten feet, as measured from the adjacent sidewalk, to accommodate retail uses. 2. 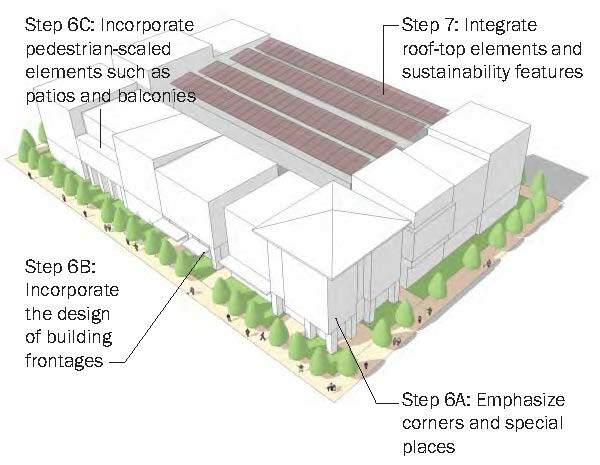 Each storefront bay should contain an entrance. The primary entrance to each commercial space on the ground floor should be located on the front façade along the street. 3. Architectural features such as canopies, awnings, lighting, and other design features should be incorporated into the ground floor to add human scale to the pedestrian experience. 4. Awnings, signs, and other features shall be located at least eight feet above the adjacent sidewalk, and may project for the width of the sidewalk to a maximum encroachment of within two feet of the curb. Awnings shall only cover individual storefronts and openings. Each storefront should contain an entrance and glazing. Building lobbies and common areas should open onto the public right-of-way and can add to the pedestrian experience. 1. A minimum of sixty percent of the street-facing façades of pedestrian-oriented uses should be composed of clear non-reflective glass that allows views of the indoor spaces. 2. Interior blinds, drapes, posters, signage, and shelving for product displays visible from the public right-of-way should obscure no more than twenty-five percent of the transparent areas of each storefront. 3. The maximum height of the bottom sill of required display windows should not exceed thirty inches above the adjacent sidewalk. The minimum head height for storefronts and windows at the ground floor should be eighty inches above the adjacent sidewalk. C. First-Floor Elevation. 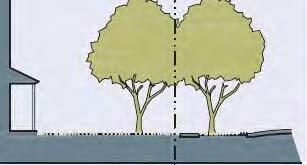 Pedestrian-oriented uses should have a floor elevation that is level with the elevation of the adjacent sidewalk. D. Entrances Facing the Street. 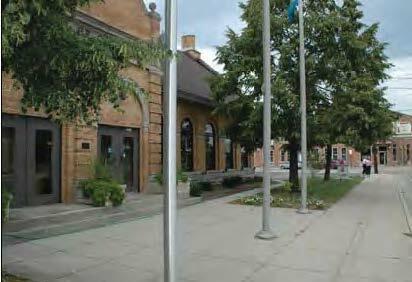 Entrances to uses on ground and upper floors should open onto a public right-of-way. Entrance doors should be set back one to three feet from the property line. 1. All projections into the public right-of-way shall require review and approval by the city public works department. See Section 11.40.160 for additional standards. 2. A continuous, unobstructed path of travel to facilitate pedestrian movement is required. 3. Outdoor dining shall not be fully enclosed. F. Vehicular Driveway Access. Vehicular driveway access or entries to parking structures are discouraged along frontages with active, pedestrian-oriented uses. Access should be taken via the alleys serving the site or, on corner lots, at the street frontage that does not contain active ground-floor uses. The director may consider alternate configurations on a project-by-project basis if such configurations are found to further the goals of the general plan and this title. A minimum of sixty percent of the street-facing façades of pedestrian-oriented uses should be composed of clear, non-reflective glass, allowing views of indoor spaces. Outdoor dining adjacent to the sidewalk is encouraged. Entrances should open onto a public right-of-way, with doors set back one to three feet. New development should include a range of frontage types to create an interesting pedestrian environment, add eyes on the street, and define the relationship of building frontages to the public realm. To add character and to reinforce unique qualities of particular communities, specific frontage types have been identified by zone, per Chapter 11.22. Overall guidelines, applicable to all frontage types, are identified below. Additional guidelines are identified on the following pages for each specific frontage type. A. General Guidelines Applicable to All Frontage Types. 1. Each building is encouraged to incorporate the frontage types allowed in the development standards table for the zone applicable to the site. 2. 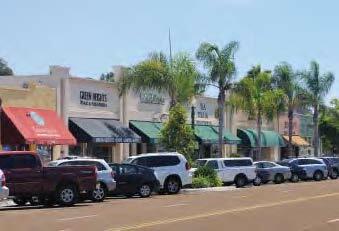 Each building should incorporate an allowed frontage wherever the lot’s boundary is adjacent to a public right-of-way or an open space such as a plaza, park, or paseo. 3. Unless specified otherwise, a frontage type should be applied for a lot’s entire primary frontage and for at least fifty percent of the side street frontage of a corner lot. 4. Ground-floor windows shall not be opaque or tinted. 5. As allowed by this section, frontage types may be combined, subject to the review and approval of the director. B. Gallery Frontage Type. 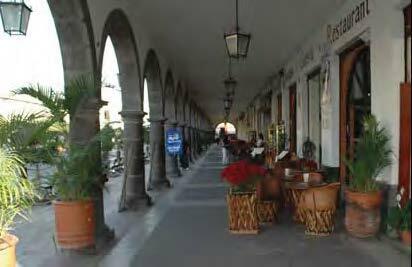 A gallery is a roof or deck projecting from the façade of a building and supported by columns. Galleries should typically be located behind the property line and outside of the right-of-way. 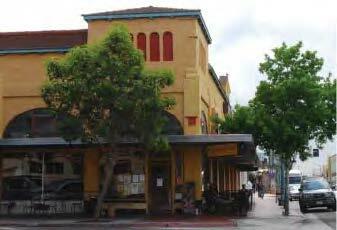 A gallery may be combined with other frontage types such as a front yard, shopfront, or forecourt. A variety of gallery designs are possible, subject to city approval, per the following, and as further described in the diagram and photos below. 1. The height and proportions of the gallery should correspond to the façade and be consistent with the architectural style of the building. 2. The minimum dimensions of a gallery should measure eight feet in width and twelve feet in height. 3. Soffits, columns, and arches should be treated consistent with the architecture of the building. 4. A gallery shall correspond to the openings along the façade(s) to which the gallery is being applied. 5. Where storefront openings are present, spacing between openings along the right-of-way should measure between eight and thirty feet in relation to the storefront(s) and the height of the ground floor. 6. The use of awnings is discouraged with the gallery frontage type. 7. 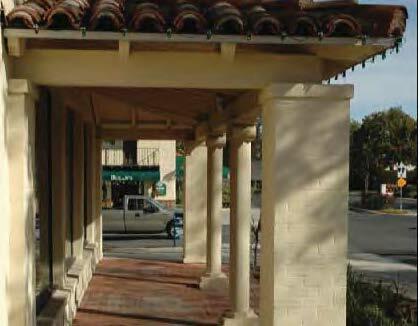 Street lights are allowed on the face of the gallery columns; provided, that a minimum clearance of two feet exists between the light fixture and any adjacent curb face. 8. Signage may be applied to the gallery per the requirements of this code. 9. The gallery frontage type may be subject to the granting of an encroachment permit by the city. Section diagram of a gallery. The below examples represent the general range of scale, configuration, and streetscape typically associated with the gallery frontage type. Individual designs may vary; provided, that they are in compliance with the applicable standards; the below examples are not intended to be interpreted literally. C. Shopfront Frontage Type. Shopfronts are large, glazed openings in a façade filled with doors and transparent glass in a storefront assembly, and may be combined with the gallery and forecourt frontage types. This traditional retail frontage type is often provided with canopies or awnings, which may be fixed or retractable, to shelter pedestrians and shade the storefront glass from glare. 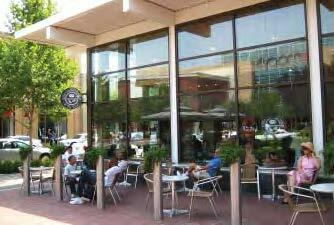 The storefront assembly may be recessed to provide a widened sidewalk or a covered area for outdoor dining. A variety of shopfront designs are possible, subject to city approval, per the following, and as further described in the diagram and photos below. Additionally, guidelines from Section 11.23.070 shall apply to ground-floor retail and pedestrian-oriented uses. 1. 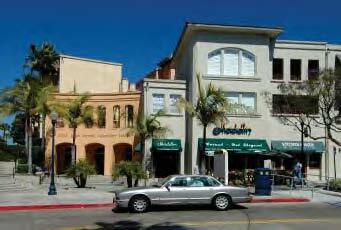 Storefronts within the overall façade may be recessed from any frontage line by up to ten feet. 2. Glazing may terminate directly at the grade, in compliance with all applicable requirements. Where a building material other than glazing is provided as a bulkhead transition between the glazing and grade, that material should measure between ten inches and thirty-six inches tall. Aluminum storefront or spandrel panel may not be used as the bulkhead transition material. 3. Storefront windows should provide clear views of merchandise displays within the shop space, and/or a maintained and lighted merchandise display within a display zone of approximately four feet in depth from the glass. 4. Where transoms are present, awnings should be located between the transom and the window below to allow light to enter the building while shading the view of the window for the pedestrian. 5. Signage may be applied to the shopfront per the requirements of this code. Section diagram of a shopfront. The below examples represent the general range of scale, configuration, and streetscape typically associated with the shopfront frontage type. Individual designs may vary; provided, that they are in compliance with the applicable standards; the below examples are not intended to be interpreted literally. D. Forecourt Frontage Type. A forecourt is a public space formed by a substantial recess in the façade of a building, and may be combined with the gallery and shopfront frontage types. Forecourts are generally appropriate for commercial or civic use or for vehicular drop-off at a civic building or hotel, as distinct from courtyards that are semipublic or private spaces providing frontages of a generally residential character. A variety of forecourt designs are possible, subject to city approval, per the following and as further described in the diagram and photos below. 1. Forecourts should be between fifteen and one hundred feet wide along the adjacent sidewalk or public space, and between fifteen and one hundred feet in depth as measured from the adjacent public sidewalk or open space. 2. The forecourt may be raised up to three feet from the adjacent sidewalk or public space, creating a small retaining wall at the property line, in compliance with accessibility requirements, with entry steps to the forecourt. 3. Where the forecourt is at least forty feet in depth, the forecourt may be terraced from the adjacent public sidewalk or open space and in compliance with accessibility requirements. 4. Where the forecourt is providing vehicular access into the lot, additional street and access requirements apply. 5. 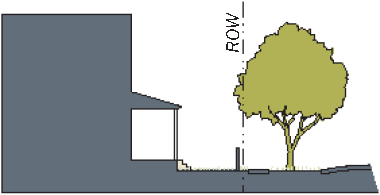 Encroachments within the forecourt are allowed up to a cumulative one-third of the width and a cumulative one-third of the depth of the forecourt. Section diagram of a forecourt. The below examples represent the general range of scale, configuration, and streetscape typically associated with the forecourt frontage type. Individual designs may vary; provided, that they are in compliance with the applicable standards; the below examples are not intended to be interpreted literally. E. Terrace/Stoop Frontage Type. 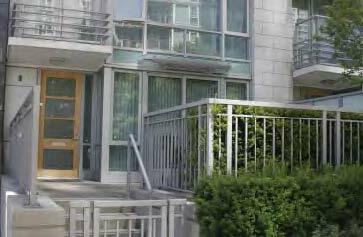 Terraces and stoops are first-floor private or semiprivate entry spaces in close proximity to the frontage line and may be elevated from the sidewalk for privacy with an exterior stair and landing at the building entrance. This frontage type is appropriate for ground-floor residential uses and live/work uses. A variety of stoop designs are possible, subject to city approval, per the following and as further described in the diagram and photos below. 1. This frontage type may be located at grade or raised up to three feet from the adjacent grade to transition into the building. 2. Terraces should measure at least six feet in depth and twelve feet in width. 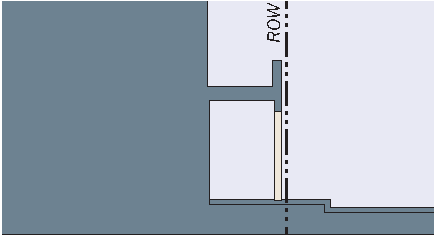 Section diagram of a terrace or stoop. These examples represent the general range of scale, configuration, and streetscape typically associated with this frontage type. Individual designs may vary; provided, that they are in compliance with the applicable standards; the below examples are not intended to be interpreted literally. F. Porch Frontage Type. Porches are covered spaces set back from the frontage line, with a front yard between the sidewalk and the porch. Porches can be raised or at grade, and provide a physical transition from the sidewalk to the building. A fence or wall at the property line may be used to define the private space of the yard. The front yard may also be raised from the sidewalk, creating a small retaining wall at the property line, with entry steps to the yard. A variety of porch designs are possible, subject to city approval, per the following and as further described in the diagram and photos below. 1. Porches should measure at least six feet in depth and twelve feet in width, and should be consistent with the architectural style of the building. 2. Porches may be at grade or raised up to three feet from the adjacent grade to transition into the building. 3. Fences or walls defining and/or retaining the front yard should not exceed three feet in height from the adjacent sidewalk. 4. Signage may be applied to the porch, per the requirements of this code. Section diagram of a porch. These examples represent the general range of scale, configuration, and streetscape typically associated with the porch frontage type. Individual designs may vary; provided, that they are in compliance with the applicable standards; these examples are not intended to be interpreted literally. G. Front Yard Frontage Type. 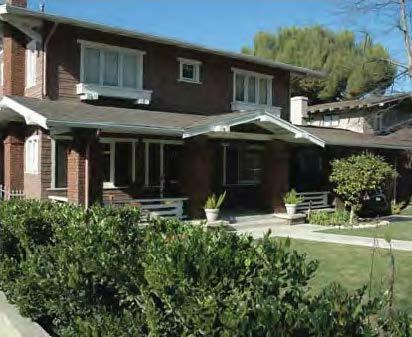 Front yards are distinct from the porch frontage type in that the front yard type is intended as a large buffer and area free of major building encroachments created by substantially setting back the building façades from the frontage line. Front yards are intended to be visually continuous with adjacent yards, supporting a common landscape, and should not be fenced. 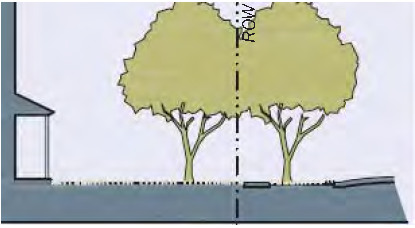 A variety of front yard designs are possible, subject to city approval, per the following and as further described in the diagram and photos below. 1. The size of front yards should be determined by the required front yard setback of the applicable zone. 2. Awnings, balconies, stairs, and porches that provide access to buildings may encroach into the front yard for a maximum of twenty percent of the required setback. 3. Fences may not exceed three feet in height and are subject to the city’s approval. 4. In response to the intended physical context of the applicable zone, front yards may be designed as primarily landscape or primarily hardscape, with landscape in containers or planters. Section diagram of a front yard. These examples represent the general range of scale, configuration, and streetscape typically associated with the front yard frontage type. Individual designs may vary; provided, that they are in compliance with the applicable standards; the below examples are not intended to be interpreted literally. A. Program Purpose. 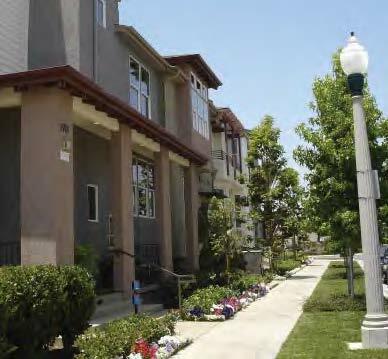 South Gate has established a density bonus program, permitting opportunities for increased density, floor area, and/or building height, for projects that provide public improvements beyond those required by this title. Density bonus incentives are available for qualified projects subject to review and demonstration of consistency with the incentive standards of this section, and consistency with the development standards of the applicable zone. 1. This density bonus program is separate from the bonus system and standards of Chapter 11.31, Density Bonus for Affordable Housing. 2. Chapter 11.22, Urban Mixed-Use Zones, identifies a “maximum with bonus” in the Development Standards tables for each zone. i. The “maximum with bonus” is applicable only to incentives specified in this section. ii. The “maximum with bonus” may not be achievable on all sites, as site conditions or superseding development regulations may reduce development potential. iii. Density bonuses for affordable housing shall be permitted to exceed the “Maximum with Bonus” in accordance with Government Code Section 65915 et seq., and as amended. 1. Computation of Density Bonuses. The percentages of all the bonus options identified in Table 11.23-3 for the project shall be added together. The total shall then applied to the number of units, to determine the additional units allowed. 2. Interpretation. The planning director shall have discretion to determine the total density bonus accrued, based on consistency with the intent of the density bonus program and the magnitude of benefit or amenity with respect to the development size. The planning commission shall approve the bonus determination. 3. Maximum Bonus. The maximum bonus allowed for the provision of improvements or amenities, as identified in subsection (C) of this section, shall be limited to the available “maximum with bonus” as regulated in the development standards of that zone. 4. Compliance with Standards. All requirements of the density bonus program must be met in full to receive the bonus. The applicant shall document all of the density bonus requirements that are met. Documentation is required prior to the issuance of building permits for bonus units. 5. Covenants. The applicant must sign a covenant that ensures that the improvements or amenities provided to achieve any density bonus will continue to be provided for the life of the project. C. Incentives. Refer to Table 11.23-3 for a summary of improvements or amenities that may be provided as density bonus incentives, as well as related requirements and available density increases. In order to be eligible for the density bonus program, projects shall either (1) incorporate a child day care facility, or (2) contribute two or more public improvements or amenities in excess of the minimum required standards of this title. Public improvements or amenities shall be provided within the development, or as permitted by the applicable incentive. i. Provision of a transportation system management plan, which describes the full set of facilities and services to be provided by a development project, proposed to reduce the number of employee commute trips to the site; plus any other facilities, amenities, or services intended to encourage carpool, vanpool, transit, bicycle, or pedestrian commuting. a. Provision may be satisfied through direct provision of a child care facility, or a reasonable commensurate monetary contribution for the development of a child care facility. b. Definition. “Child day care facility,” for purposes of the incentive, shall mean a child day care facility, other than a family day care home, including, but not limited to, infant centers, preschools, extended day care facilities, and school age child care centers. c. Location. Facility shall be located on the premises of, as part of, or directly adjacent to the development project. d. Size and Layout. Facility shall include the provision of both indoor and immediately adjacent outdoor facilities. a. Space provided shall be in addition to any common outdoor open space provided within the development as required by Section 11.23.050, Open space requirements. b. Space shall comply with the standards of this title and the city parks and recreation plan, and as amended. c. Space shall be privately maintained, unless donated to and recorded by the city. d. Parks and open space contributions may be satisfied through the direct provision of public parks or open space, the provision of land for parks/open space, or a reasonable commensurate monetary contribution to the creation of an off-site public park/open space. e. Size and Layout. Must be at least 500 square feet in area, with the smallest side measuring a minimum of 12 feet or greater. Provision of public facilities, such as a library or meeting space, open for public use and gatherings. a. Public gathering space contributions may be satisfied through the direct provision of public gathering space, the provision of land for public gathering space, or a reasonable commensurate monetary contribution to the creation of an off-site public gathering space. b. Size and Layout. Must be at least 500 square feet in area, with the smallest side measuring a minimum of 12 feet or greater. 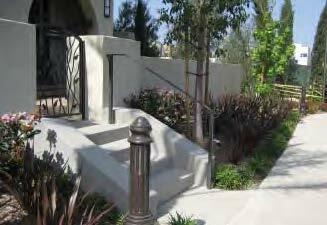 a. Off-site street landscaping shall be in addition to required on-site landscaping. b. Off-site street landscaping contributions may be satisfied through the direct provision of this improvement, or a reasonable commensurate monetary contribution for off-site street landscaping. c. Size and Layout. Must be at least 500 square feet in area. Provision of publicly accessible and visible art or creation (including appropriate funding) of a public cultural arts program. a. Provision shall be in excess of the requirements of Chapter 11.32, Art in Public Places Program. b. Provision may be satisfied through direct provision of the art or program, or a reasonable commensurate monetary contribution for art or cultural arts program(s). Preservation of historic resources, either on site or elsewhere in the city. a. All preservation shall be consistent with the regulations and standards of Section 11.40.070, Historic resources. b. 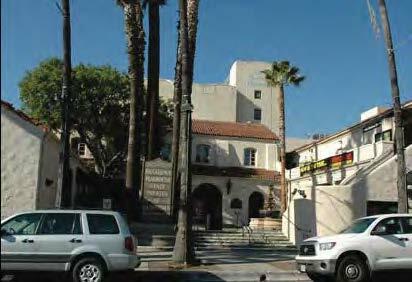 Where a project preserves and reuses an existing designated historic building, the gross floor area of the designated historic structure may be excluded from the calculation of the total FAR of the project, contingent on the project maintaining the historic and architectural character of the structure, and all rehabilitation does not adversely affect the structure. c. Monetary contribution for preservation of historic resources will not qualify for incentives. a. Certification shall be by the U.S. Green Building Council (USGBC), the Green Point Rated system, Build-it-Green, or compliance with another reputable independent and nationally-recognized organization, deemed appropriate by the city. b. All additional floor area and/or dwelling units achieved through the green building incentive shall be built to the same certified green building standards as the eligible project. c. Intent to achieve certification shall be demonstrated at the time of permitting, and subsequent final certification shall be demonstrated to the city per the USGBC (or applicable) certification schedule. If the project does not achieve certification, penalties equivalent to the value of the bonus may apply. d. Monetary contribution for green building shall not qualify for incentives.